The name Skeljaskrímsli, “shell monster”, refers to a number of Icelandic shore animals known by a variety of names. Consistent among the accounts are the association with the beach, a hump on the back, and a coat of shells that rattle as the creature walks. Shell monsters have been sighted on the coasts of all the main regions of Iceland, and at least one report (the Glúmsstaðir farm’s in Fljótavík, Hornstrandir) describes a freshwater specimen. As specified by Hlidberg and Aegisson, the skeljaskrímsli proper is a quadrupedal marine creature, bulky and powerfully built. It is the size of a winter’s old bull calf or a huge horse. The neck is broad, the jaws and teeth impressive, and the eyes reddish. There may be a phosphorescent glow coming from the mouth. The skeljaskrímsli’s tail is long and armed with a lump at the end. The short, strong legs end in circular feet armed with large claws. The skeljaskrímsli earns its name from the thick reflective coat of shells (or flaky scales) that covers its body. These rattle and scrape against each other as the creature moves, giving warning of its arrival. As the shell monster approaches, its powerful stench also becomes apparent. There is little good to say about the shell monster – even its blood is toxic. Skeljaskrímslis live in the sea and haul themselves onto shore in the dark moonless nights of the northern winter. Often they can be seen before or after spells of bad weather and storms. They are attracted to light and will leave deep gouges in farmhouse doors. Suffice to say that anyone who encounters one of these surly brutes will be in for a bad time. Most weapons are useless against a skeljaskrímsli’s formidable defenses. One farmer who battled a skeljaskrímsli managed to keep it at bay until the monster tired and returned to the sea; the farmer was stricken with leprosy for his trouble. Another farmer managed to wound a skeljaskrímsli, but some of its poisonous blood spattered onto him, and he died in agony soon after. To harm a skeljaskrímsli one must resort to alternative ammunition. Shooting silver buttons, grey willow catkins, or lamb droppings from a gun are the only ways to injure and kill this beast. The Fjörulalli is the best-known variant of the skeljaskrímsli. It is also the size of a winter’s old bull calf, and has been reported as being smaller, about as big as a dog. A tail may or may not be present, and the head is a small, rounded outgrowth. It is covered with shells or lava fragments that scrape together as it moves. Unlike the larger shell-monsters, these smaller ones are usually harmless. They will, however, tear the udders off sheep, and pregnant women should avoid them lest they negatively affect their unborn babies. Hlidberg, J. B. and Aegisson, S.; McQueen, F. J. M. and Kjartansson, R., trans. (2011) Meeting with Monsters. JPV utgafa, Reykjavik. Amhuluk is a creature associated with drowning, disease, and the malarial fog that rises from the water’s surface. The Kalapuya of the Willamette River locate the Amhuluk in a lake near Forked Mountain, fifteen miles west of Forest Grove in northwestern Oregon. He originally wanted to inhabit the Atfalati plains but eventually went into the more comfortable lake. There he settled and indulged his passion – drowning others. Amhuluk is terrible to see. He is spotted, with long spotted horns on his head, and his four legs are hairless. Various items are tied to his body so they can be carried around. He keeps several spotted dogs. Wherever he steps, the ground sinks and softens. Everything Amhuluk sees is captured and drowned in his lake. Even the trees around the lake have their crowns upside-down around the lake, and the sky itself is drowned in the muddy water. The banks of the lake are slimy and boggy, trapping all manner of animals. Grizzly bears instinctively enter the lake when they grow old, and are changed into other beasts. The Atúnkai, an otter or seal-like water creature, is the usual product of this metamorphosis. Three children once went out in search of adsadsh-root. There, at Forked Mountain, they met Amhuluk rising out of the ground, and marveled at his beautiful spotted horns. “Let’s take the horns”, they said, “and make digging tools out of them”. But Amhuluk impaled and lifted up two of the children on his horns while the eldest boy escaped. The child returned home in terror. “Something horrible has taken my brother and sister”, he told his father. Then he slept, and his parents could see that his body was covered in blotches. The father went out, retracing his children’s steps to the Forked Mountain. There the bodies of his children appeared out of the fog rising on the water. They were still impaled on Amhuluk’s horns, and they cried “Didei, didei, didei” (“we have changed bodies”). Five times they rose and spoke, and five times their father wailed mournfully. For five days he waited, camping near the lake and mourning his children, and each of those days they appeared, repeating their sad litany – “Didei, didei, didei”. Then they sank under the surface and were never seen again. Amhuluk had claimed them for his own. Gatschet, A. S. (1888) A Migration Legend of the Creek Indians, v. II. R. P. Studley & Co., St. Louis. Gatschet, A. S. (1891) Oregonian Folklore. Journal of American Folk-lore, v. IV, pp. 139-143. Gatschet, A. S. (1899) Water-monsters of American Aborigines. Journal of American Folk-lore, v. 12, pp. 255-260. Skinner, C. M. (1896) Myths and Legends of our Own Lands, v. II. J. B. Lippincott Company, Philadelphia. Like so many other lake monsters, the true nature and appearance of the Beathach Mòr Loch Odha, the “Big Beast of Loch Awe”, is shrouded in mystery. Some say it resembles a giant horse, while others describe a colossal eel. What is known for certain is that the Big Beast is a large and powerful creature with twelve legs. It can be heard in the dead of winter, breaking the ice on the frozen loch. It has been a long time since the Big Beast was last seen. Its existence is all but forgotten on the shores of Loch Awe, and a resident of Ford interviewed by Fleming in 2001 had nothing to say on its subject. Campbell, J. G. (1900) Superstitions of the Highlands and Islands of Scotland. James MacLehose and Sons, Glasgow. Fleming, M. (2002) Not of this World: Creatures of the Supernatural in Scotland. Mercat Press, Edinburgh. The Biasd Na Srogaig, the “Beast of the Lowering Horn”, is a unicorn or lake monster native to the lochs in the Scottish Isle of Skye. Other than a single large horn on its forehead, it had little in common with the true unicorn, being tall and clumsy, with long gangly legs and an awkward gait. Originally a nursery bogey, the biasd na srogaig eventually developed a life of its own as children brought their fears into adulthood. Campbell derives the biasd na srogaig’s name from scrogag, a term applied to snuff horns. It is more correctly written as sgrogag, “crumpled horn”. 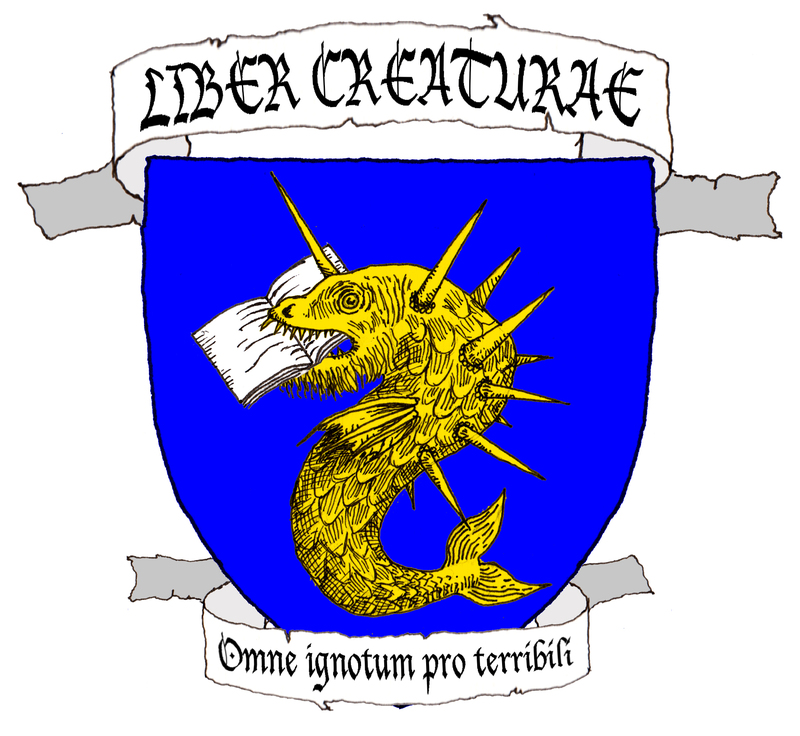 To further muddle the etymological mixture, béist na sgrogaig has been used as synonymous with the heraldic unicorn. Campbell, J. G.; Black, R. (ed.) (2005) The Gaelic Otherworld. Antony Rowe Ltd, Chippenham. The Swan Valley Monster made its appearance on August 22, 1868, in the otherwise tranquil locale of Swan Valley, Idaho. Its presence was witnessed and reacted to by an unnamed old-timer crossing the river at Olds Ferry. The first thing he saw of the monster was an elephant’s trunk rising from below the surface and spouting water. This was followed by a snake-like head the size of a washtub, with a single horn that kept moving up and down, and long black whiskers on both sides of the face. It had ten-inch-long fangs and a red forked tongue that spewed green poison. When it hauled its massive body onto the shore, the old-timer noted that it must have been twenty feet long, and it stank to high heaven. A pair of wing-like fins – or fin-like wings – came out of the sides of its neck. Its forward half was like a snake, the thickness of a calf, greenish-yellow with red and black spots; this in turn led into a fish-like section with hand-sized rainbow scales shining in the sun; finally, the tail was a drab, scaly gray like a crocodile or lizard tail. Shiny black barbed spines, like those of a porcupine, lined its back from head to tail. Finally, it had twelve stubby legs that were easily missed at first glance; the first pair under the fins had hoofs, followed by two pairs of legs with razor-sharp claws, then a pair of hoofed feet, a pair of clawed feet, and another pair of hoofed feet near the tail. Of course, the old-timer’s first reaction to the abomination slithering up the bank was to fire a slug into its eye. The monster reared up, hissing, bellowing, and spurting poison over its surroundings, so it got shot a second time in its yellow belly, convulsed, and stopped moving. Everything its poison had touched, whether trees or grass or other living beings, withered and died. As the monster was too large to be carried off by one man, the old-timer returned to town to fetch a wagon and six strapping lads to help him, as well as a tarp to protect them from the poison. They could smell the odoriferous creature a hundred yards away, and one of the men had to stay with the horses to keep them from bolting, while another got sick and refused to come any closer. But when they reached the bank where the monster had fallen, there was nothing but withered vegetation and a trail leading to the water. Presumably the Swan Valley monster had crawled back into the river to die – or perhaps it didn’t die. Whatever its fate, the old-timer recommended keeping a close watch on the river, as “I’ve hunted an trapped an fished all over the state fer nigh ontuh seventy-five year… but I ain’t never seen nothin tuh compare with that speciment”. Clough, B. C. (1947) The American Imagination at Work. Alfred A. Knopf, New York. Fisher, V. ed. (1939) Idaho Lore. Federal Writers’ Project, The Caxton Printers, Caldwell. Lewicki, J. and the editors of LIFE (1960) Folklore of America, part V. LIFE Magazine, Aug. 22, 1960. The Lüschersee, a small Swiss alpine lake nestled in the heather-covered hills of Graubünden, seems tranquil enough on the surface. Yet it is said that the lake’s waters reach down to the center of the Earth, where eternal fires rage. This is the home of the Butatsch Cun Ilgs, the “Cow’s Stomach”. Long ago, during a more feudal time, the shepherds of Graubünden were in a constant struggle for freedom from the cruel barons and lords of the land. Their masters were prone to treating them unjustly, and even harming them for sport. A group of noblemen once returned from an ibex hunt to find herds of cattle and sheep grazing peacefully by the Lüschersee. Naturally they decided to kill them. With loud whoops and peals of laughter, they drove the animals before them, hacking at them with their swords and forcing them into the lake to drown. The peasants could only watch as the lords mocked them. It was then that the water started to foam and bubble, and the Butatsch cun ilgs heaved itself onto the shore. 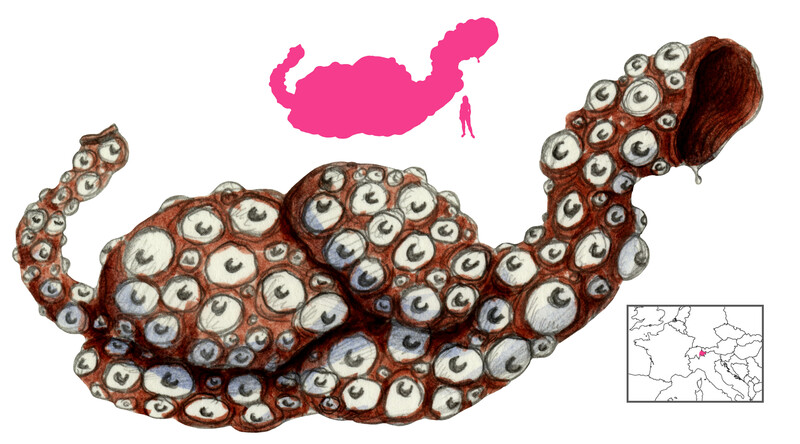 It had the appearance of an enormous cow’s stomach, and was covered with thousands of eyes. The eyes had hypnotic powers, and if they focused on one point, bone-melting flames would erupt. Mesmerized by the Butatsch cun ilgs, the lords stood dumbly as the enormous mass trampled and crushed them. Butatsch cun ilgs slipped back into the water after killing them all, leaving the shepherds terrified but unharmed. Since then Butatsch cun ilgs has only reappeared twice, in 100-year intervals. The second time it came out of the Lüschersee, it gouged the rapids of the Nolla along its path. The third time was during a terrifying thunderstorm, when the monster of the Lüschersee slithered through a rivulet, tearing out the banks, causing massive landslides, and creating ravines. After this last appearance – the starmentusa notg or “Night of Terror” – the Butatsch cun ilgs was not seen again. Yet sometimes a distant, unearthly bellowing can be heard over the still waters of the lake… “The Lüschersee roars”, say the shepherds, and bring the hay in. Burde-Schneidewind, G. (1977) Historische Volkssagen Aus Dem 13. Bis 19. Jahrhundert. Akademie-Verlag, Berlin. Derichsweiler, W. Das Safiental. In Schweizer Alpenclub (1919) Jahrbuch das Schweizer Alpenclub. Stämpfl & Co., Bern. Jecklin, D. (1874) Volksthümliches aus Graubünden. Orell Füssli & Co., Zürich. Rose, C. (2000) Giants, Monsters, and Dragons. W. W. Norton and Co., New York.